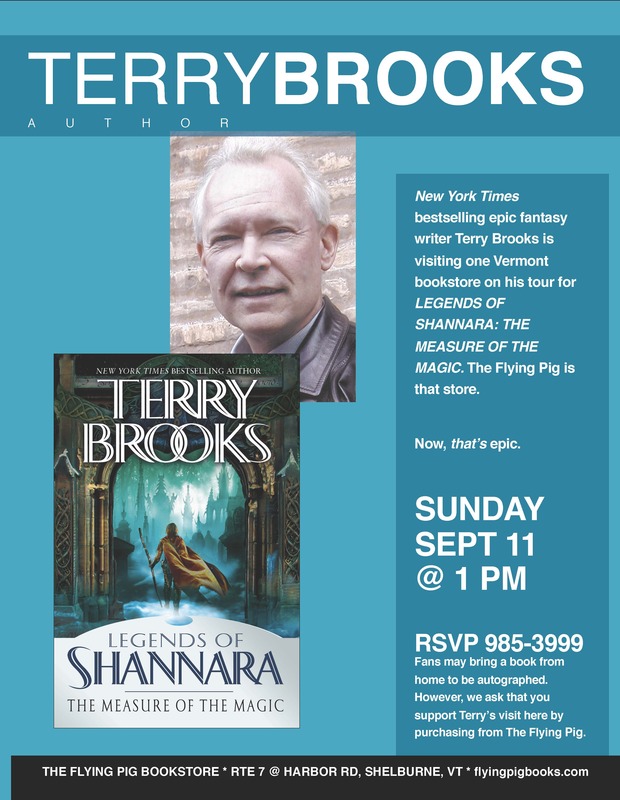 Reminder: Terry Brooks in Vermont! After more than three decades of captivating epic fantasy readers, the storytelling magic of New York Times bestselling author Terry Brooks’s Shannara saga continues to enthrall. Now the fascinating chronicle of Shannara’s prehistory reaches a thrilling new peak in the sequel to Bearers of the Black Staff, Measure of Magic: Legends of Shannara. The store will have all of his backlist books available, and the new book will be 20% off before and during the event. There will be an RSVP required: 802-985-3999 or flyingpigevents@gmail.com. This entry was tagged Flying Pig Bookstore, Shelburne, Terry Brooks. Bookmark the permalink.